Black Lives Don't Seem to Matter to "Black Lives Matter"
Louisianan calls out BLM, Black Panther hypocrites: Where are you, if Black Lives Matter? Doesn't surprise me. But then I'm just a cynical old curmudgeon. Hey black Louisiana, just contact G. Soros, the BLM founder & funder. The prez obozo most likely has a golf club up his a** right now so he won't help either. Yeah, but imagine how bad it would be if Obama hadn't reversed the rise of the oceans. I hope that black folks, through the problems in Baton Rouge, will understand that the panthers and blm are just pushing hate politics and they only need the support of other blacks for that purpose. I just hope the people realize that the police are FOR them and not AGAINST them. Police don't want to shoot thugs who won't listen to them to put their hands up and get down on the ground; but, they fear for their own lives and are taught to shoot - not matter what color. Not saying that there aren't a few bad cops - weed them out and get them off of the force. God bless you folks down there in the floods, we are praying for you. What Jerry could have also mentioned, is that a vast majority of the volunteers are those whom the Panthers and BLM want dead. "I hope that black folks... will understand." They won't. Never have. Never will. White folks need to understand that they hate us to a degree that we find incomprehensible. BLM just exploits the hate that's already burning. A lot of race politics is identity politics, writ racial. There have always been identity politics in a democracy, it's just American identity politics with respect to race have a lot of ugly twists and turns. There were and are identity politics for the Irish, Italians, Polish, German and a host of other immigrant identities. Not all black men and women hate white people. I work alongside a bunch of black men everyday, and most of them are pretty friendly. Last night, one of them helped me out, totally unsolicited. I think a lot of black Americans are confused by BLM. They understand the words, but don't necessarily identify with the street violence. They may feel they have to stand together in racial identity politics, but are really not about to pick a fight with anyone. Listen to the words of the Sheriff of Milwaukee county. He knows the score, and will try to do his best to do his duty for everyone in the city. It's an ugly time in America, just as the late '60's were. We will ride this out, and I hope that better days are ahead. But if we all give in to hate, then things will surely burn. Soros truly wants to watch the world burn, and make billions in shorting currency options. He is truly an evil man, and I will not give into his sadistic manipulations of human beings to make money. Blacks tend to riot and burn their own neighborhood businesses.Too bad they keep voting Democrat and continue ending up in dead end schools. I know it is not quite that simple....just don't try rioting in my neighborhood. So where has Ghostsniper been? I miss him. Apparently, black lives only matter when it's cops or white people who kill them. 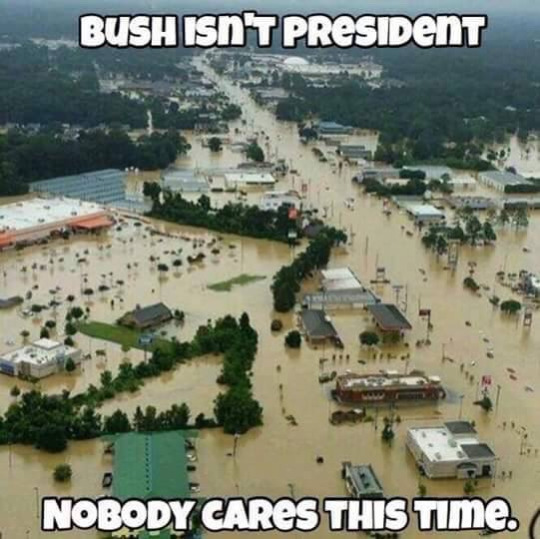 When it's other blacks or a natural disaster, not so much. Baloney. I dislike BLM as much as anyone but rescue work isn't what they do. Asking where the NRA or PTA is would be just as legitimate.